It was that time of the year when I was eagerly waiting for the BikeNomads Annual Meet 2014 location and dates to be announced. After a lot of bickering on various locations, Tarkarli was the decided as this year’s Annual Meet location. The dates 7th, 8th & 9th of November, 2014 were confirmed and the plans started rolling out. It was around 700 kms from Bangalore. My biggest dilemma was arranging a bike, as mine got stolen around 6 months back 😦 . I went ahead and registered anyway, the mantra being that I would beg, borrow or steal rent a bike. A little about Tarkarli. It is a small fishing settlement south of Malvan, in the Sindhudurg district of Maharashtra, India. What makes this place interesting is that this village is located at the confluence of River Karli and the Arabian Sea. The river curves south right before it meets the sea, the estuary forms a narrow piece of land barely half a kilometer wide. The hotel we had been booked at was right in the center of this piece of land flanked by the river and the sea on both sides. You can see what I mean in the map below. As the D Day got closer six of us confirmed our registrations and plans started falling into place. The final six from Bangalore were Rajan, Diwakar, Vivek, Sushant, Poornima and of course, me. Rajan, Diwakar and Vivek planned to leave one day in advance as they wanted to take a halt in Goa. Sushant and I on the other hand were leaving early morning on the 7th planning to reach Tarkarli by evening. All of us had decent riding experience except Poornima, who had only travelled pillion on bikes. She was going pillion with me in this trip, and I was initially a bit skeptical but knowing that she had done a trip to Ladhak as a pillion gave me the assurance that she would be fine to go through with this journey. She has otherwise been an avid backpacker and that helped see through things for her. Bikes ready and riding gear checked we did our final checks on 6th night and hit the sack so that we could start early next day. Oh, I missed mentioning I rented a KTM Duke 200 from Indimotards. And Sushant was using a TVS Apache classic. I think I can add here that this was the same bike I attempted the saddle-sore on. Fondly called Kaira, the tried and trusted one. We managed to get up on time and were out and about by 5 in the morning, took the Tumkur Road to exit Bangalore. We did good time as early morning meant less local traffic. We stopped for breakfast at Chitradurg and also filled fuel there. Yes, the duke with just a 10 liter tank had a range of only 220 – 250 kms. 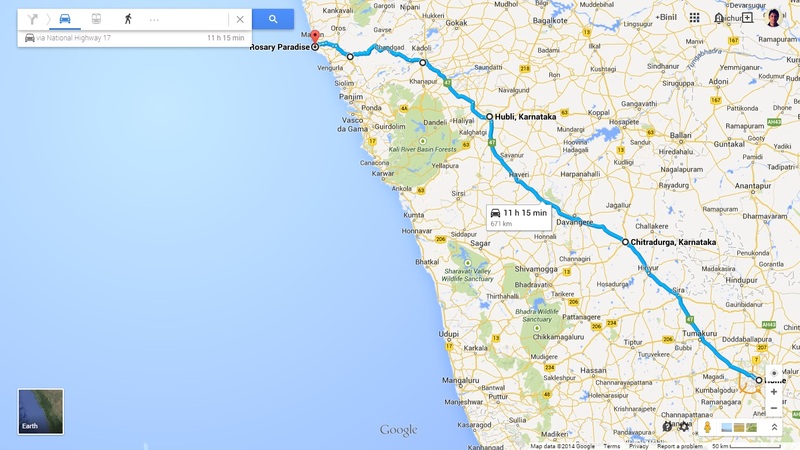 The roads till Belgaum were good and most of it was part of the Golden Quadrilateral (GQ). We were averaging 100 – 110 kmph. We crossed Devengere, Hubli-Dharwad on the way. It would have been quite eventless and boring considering straight stretches of road, had it not been for the few ‘burnt ego’ car drivers who couldn’t digest the fact that we were going faster than them. This included a Jaguar XF and a couple of local Rossis’. We reached Belgaum by around 4 in the evening, took long considering the pace we were keeping. The culprit had been lack of sleep. We ended up taking a couple of nap breaks. Better safe than sorry. 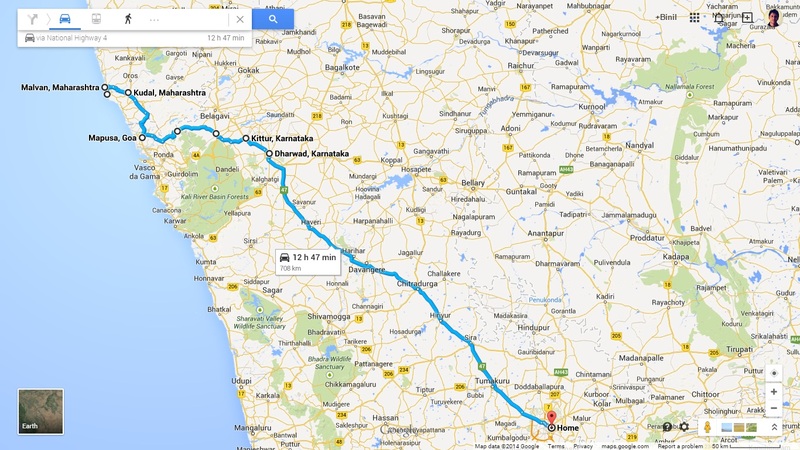 From Belgaum the plan was to take the Swantwadi route via Amboli Ghats. We were expecting bad roads but with only 150kms left we were expecting to reach our destination soon. The whole stretch was a disaster. Potholes all over the place and the darkness setting in didn’t really help. The roads didn’t even allow us to enjoy the beautiful full moon rising in the sky. The loose gravel and rocks and flowing water at some places made it worse. It was thick jungles and not a place to even buy water in sight. It took us close to 4 hours to cross the ghats. With around 50 kms to destination we found a place to eat. It was already 8 in the night. I don’t know if it was the hunger or the food was genuinely good. It was probably the yummiest egg burjee and rotis I have had in my lifetime. Tummy’s full we geared up to finish the remaining 50kms. We got a call from Rajan and updated that we should be there in an hour or so. Everyone had reached the resort and we were the only ones left. I couldn’t have been more wrong, if I may say so, to say that we would reach in an hour. You would see why I said that soon. We soon joined the NH 17 connecting Bombay to Goa. We were super glad to be on good roads again. Soon we reached Kudal and turned left towards our destination. Nice curvy winding roads. There were hardly any people or vehicles in sight. I just assumed that it’s probably because the location is remote. I had been following the Google Maps as now I did not have any network and thanks to offline maps I was able to at least follow the route. At one point the Navigation tool asked us to turn left and behold there was no left. I was beginning to doubt the map’s credibility and called out for Sushant to stop and we checked the map on foot. To our surprise we found a Road Sign showing a left turn but no roads. All we could find was a mud stairs behind some bushes. We did not turn and headed straight thinking that we would come across another road. The Navigation rerouted and gave us new directions. The road started becoming narrower and suddenly we were in the middle of a small opening surrounded by bushes and the tool asked us to take a right. The opening to the right was not visible as it was a steep slope and had lot of gravel on the surface. Not having any choice we went down the trail hoping to reach a proper road after that. To our surprise we encountered a flight of clay/mud stairs, not having much of an option we rode down that and found ourselves in front of a dilapidated house. It was spooky. Thankfully there was a mud road leading away from the house and we ended up on a tarmac road. The joy was short lived as we found the road becoming narrower again and soon we were on a mud trail narrow enough for the bushes to hit our helmets. We could see the Karli River to our left, shimmering under the full moon. I could barely figure out what’s on my right after beyond the bushes. Technically we had not lost the way as the map showed us nearing our destination, but by now we figured that we had ended up taking a shorter but lesser used route. I don’t know if it was the urge to reach our destination soon or the hunger for adventure we kept heading on via the mud trail. It was bumpy but both the duke and the apache were holding ground pretty well. We had to stop again as both our bikes splashed through a mud slush and our bikes were caked in red mud. The trail was becoming very difficult to ride on especially during the night. I checked the maps again, and found a small clearing of around 200 – 300 meters and then another road. We took our chances and headed that way and suddenly the trail opened on to some house’s back yard. And we had a surprised resident staring back at us. I just shouted out “Rosary Paradise”, our hotel, and he just pointed to a gap between two houses. He was too shocked to utter anything. Passing through the narrow passage and riding up a set of stairs we were back on a tarmac road and we were glad to see people and vehicles on it. Soon we were riding down the road, just eager to give our bums some rest. Finally, yes finally after 15 hours of riding we reached our destination. It was 10:30 in the night and our fellow nomads were just settling in for dinner. They were all a bit worried as to where we were as there was not contact and it had been over two hours since last contact. Pleasantries exchanged, all we needed to do was sleep. After a quick grub we hit the sack. Next day, while waiting for some fellow nomads to return from a dolphin sighting trip, I figured out what went wrong the previous night. It seems the actual road was the one that went all the way to Malavan and then you head south to Tarkarli. Google had shown us the shortest route, which was actually a mud trail. On going over the route on Google Maps in earth mode I realized we were riding through a stretch which was in the middle of the river and the backwater canals. Lack of time prevented me from exploring that route in the day, but I would surely try it someday. The rest of the day went by with a group ride and lunch there on. We were around 28 of us and occupied the whole restaurant we stopped for food at. The customary photo shoot was held at the beach in front of our hotel. That was a fun moment. And the boys went berserk after the shoot and went dragging on the hard sand beach. There were a couple of spills but still the fun factor was a 10/10. During the evening we had sessions by a few of our veteran Nomads. Dr Sanket Kawli talked about Trauma Management, Navendu Singh gave us tips on Long Distance Riding and Vibhu Rishi & Rohit Parik gave us updates on what they have in mind regarding the goals and objectives of BikeNomads in the days to come. It was a day well spent and it was great to connect a lot of names to faces. I had been in touch with most of them over forums but had never met most of them in person. All in all I would just say that this trip was worth it. The return journey had all six of us from Bangalore together. 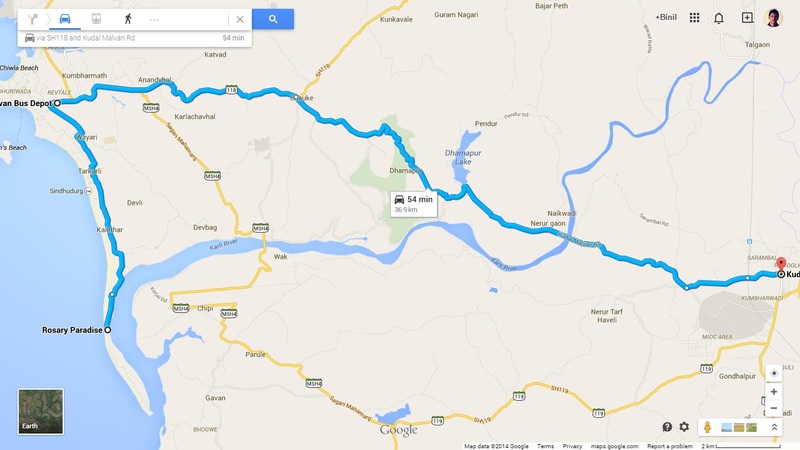 We left at 6AM and decided to take the Chorla – Khanapur route, as this was suggested as a better route. 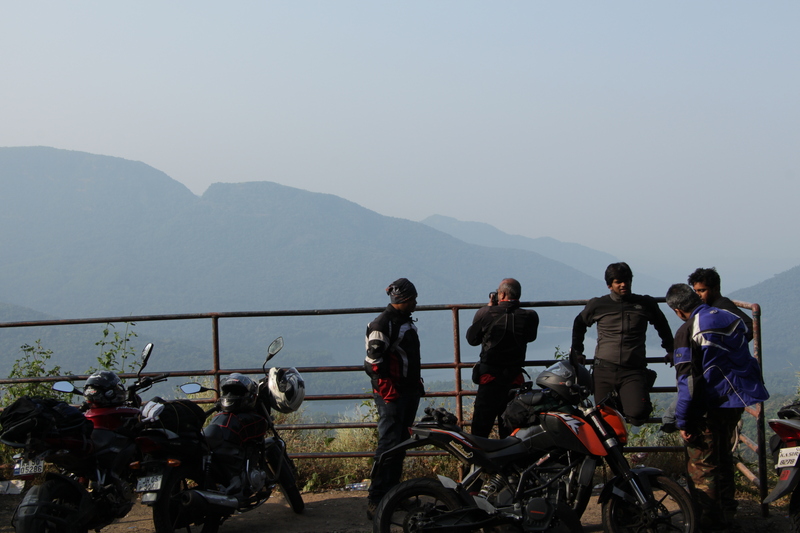 This time we went to Kudal via Malavan and headed south on the NH 17 towards Goa. We had planned to tank up in Goa due to the fuel prices there of course 😉 at just 55 bucks a litre. Tanking up at Mapusa we headed towards Chorla Ghat. This was by far one of the best stretches of roads we had covered in the last two days. Lush green forests and scenic beauty at its best. Excellent, well maintained roads. Then we turned towards Khanapur, knowing that the condition of roads is bad for around 20kms. We decided to take this route as the other okay road would take us on a longer route. The road wasn’t all that bad as it was being freshly laid. So it was level roads without potholes but were either clay or stone topped as the tar was yet to be laid. Our progress was slow but we made it through to Khanapur in around half an hour. From here we connected to the Dharwad highway (NH7) via Kittur. Stopping for lunch and later for tea we reached Bangalore by around 7PM. The delays were mostly because of the traffic due to weekend rush. This was my first BikeNomads AM and I loved every moment of it. I am proud of being part of such a group which has some of the most crazily sensible riders I have ever known.